To achieve the Governor’s Utah Life Elevated 2020 goals, DHS actively collaborates with the Governor’s Office of Management and Budget (GOMB) to use evidence-based principles and practices in operations management and quality process improvement. These projects work within GOMB’s SUCCESS framework and are grounded in the business concepts of Theory of Constraints. For more information on DHS’ SUCCESS projects, contact Staci Ghneim. Pilot project to improve the effectiveness of CPS by generating capacity for case workers to invest in trust building and standardizing a process to appropriately increase family engagement. experienced a 10% increase in touchpoints. 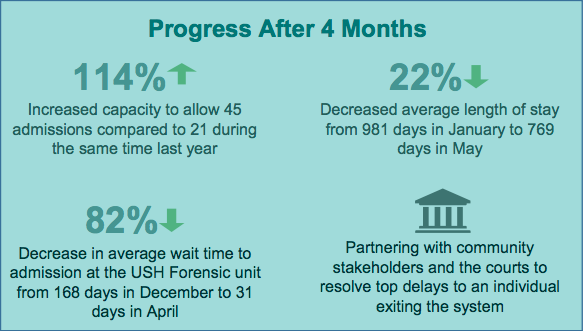 Effort to protect public safety and reduce the overall length of stay in the USH Forensic unit, where an individual’s mental competence to stand trial is restored, by triaging and screening patients into appropriate levels of service including outreach and a jail-based program. DHS has been given the opportunity to partner with a team from the Governor’s Office of Management and Budget (GOMB) to take the SUCCESS framework deeper into our operation than we have in the past. The SUCCESS+ Focused Implementation includes dedicated GOMB staff who are co-located part of the week at the DHS state office to help DHS identify new measures and strengthen current ones. We will seek a “triple win:” solutions benefit employees, our clients and the taxpayer. The SUCCESS+ Focused Implementation launched in April 2018 with Juvenile Justice Services. SUCCESS projects underway in CPS and at USH will be continuing. Working with the GOMB team, systems will identify specific areas where they can pause or stop work when the focused implementation begins to allow capacity to launch the initiative within an accelerated schedule. The expectation is that this partnership will result in every division and institution, as well as some offices and operations, having at least one direct, simplified quality measure. Among all valuable metrics pieced into systems, each will have one solid goal that represents quality. This goal will align with the Department purpose.